Planispheres are maps of the celestial stars as seen from earth. 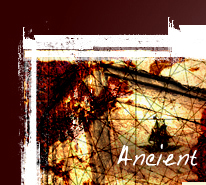 They are the replacement for the planispheric astrolabe. Planispheres drastically reduced the complexities of the planispheric astrolabes and they mapped the heavens in an easier to follow chart. 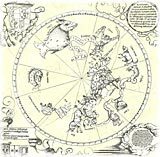 The first star chart to be called a planisphere was created in 1624. 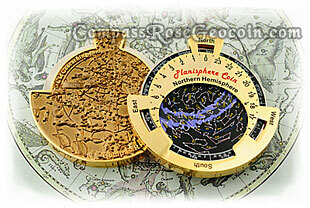 Planispheres are great for learning the constellations and knowing the exact position of the stars at a particular time to get more accurate readings when used with other navigational tools such as the quadrant, nocturnal, astrolabe, back staff, and sextant. One disadvantage of translating stars from an actual spherical view our sky to a flat disk is the effect of distortion on the real size of the constellations towards the edge of the disk. It causes the images towards the edge of the disk to become stretched out. However, with some practice you will become a pro with this device in no time and be able to compensate for this distortion. Normally, planispheres consist of several disks which map the stars as viewed from different latitudes and for different seasons. 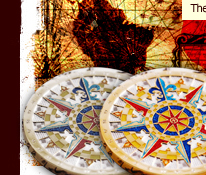 The planisphere geocoins we have made do not have interchangeable disks; however, they still give you a good idea of where the stars are at any time of day, and provide you with a pocket sized tool to help learn the constellations. 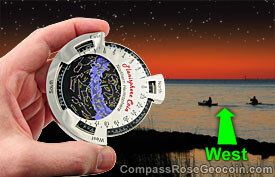 Its 3.25" diameter size makes it portable, and being made out of metal makes it very durable. Both Northern Hemisphere and Southern Hemisphere versions are available. 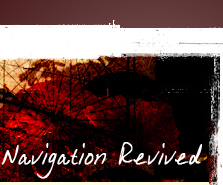 We recommend you get both versions if you live between the 30 degree north and 30 degree south latitudes. 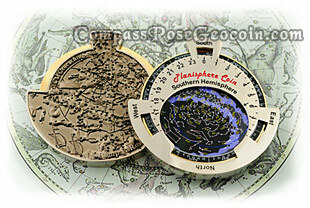 The Planisphere Geocoin™ is set for standard daylight time. If you live in a region which observes daylight saving time, you will need to offset the star disk by one hour during the daylight saving period. 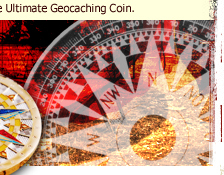 The Planisphere Geocoin� is trackabe on Geocaching.com and has its own icon. It measures 3.25" in diameter, and is available in 24K polished gold for the northern hemisphere and durable polished nickel for the southern hemisphere. Each coin comes encased in a protective foam and cardboard casing. 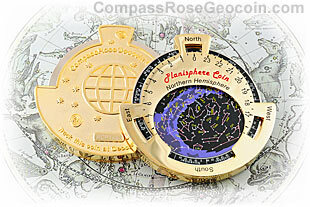 The picture below is of the 2008 version of the Planisphere geocoin.